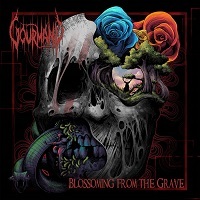 GOURMAND is a Progressive Death Metal band formed in 2017 from Kansas City, Missouri. This is only the bands second length LP, but in under 2 years. I don’t often see a band tackle a sophomore album so quickly, and I have not listened to 2017’s "The Inquisitionist." I don’t really have the perspective of judging how they have or haven’t changed, so keep that in mind. The album opens with a stellar track “Blossoming From the Grave,” which contains punishing double bass peppered with acoustic passages as well. The transitions don’t feel forced but flow very well back and forth forming a nice ebb and flow. The second track “A Message In Wax,’’ has a surprise for us with cello mixed into the chaos, but it won’t be the last song to feature it. There is a massive shift between blast beats and mellow sections that seems to be an overall theme to their sound I am enjoying. “Between Vessel and Body” has a really beautiful acoustic section midway through the song that I really enjoy. I really enjoy the choices of riffs and melodies these guys choose. I am more into catchier death metal, but there are exceptions and the quality of songwriting in this makes it an exception for me. “Metamorphosis” has some really choice bass playing stand out in the song and some clean vocals that don't overwhelm the song but just lift the songs melody without lessening the brutality. I did not intend to write about every song, but there seem to be something good to find in each song that stands out and “Redemption” so far, is the highlight of the album for me. A completely non-metal slow sad dirge with samples of a man speaking philosophically, I had to rewind and replay the song. It would not be out of place on an Anathema album. Overall there is some nice contrast in the sound in the songs on here. There is plenty of experimentation, which shows what I believe: that metal is the home to the most growth and pushing of boundaries of any genre today. The cello playing in this really sticks out to give it more memorability beyond the sum of its parts. Progressive and Technical Death Metal are 2 sub-genres that are very hard to not be a needle in a haystack in. GOURMAND also benefits from some very good songwriting and I do hope to see them gain a bigger audience. If anything I would like to see what they could do with more clean vocals as they do so well with the more melodic parts of their songs. Clean vocals don’t fit every band, but if they do it and do it well, I welcome it. I don’t really feel like anything is poorly executed on this album. I would like a little cleaner production, but I feel that is a personal preference to what i usually listen to. This seems to be a great album to expose the band to a bigger audience and I will certainly keep my eye out for what the band does moving forward. Overall: A rock solid death metal album with some nice experimentation! Fans of the genre should definitely give this a listen if my description sounds like something they would enjoy.